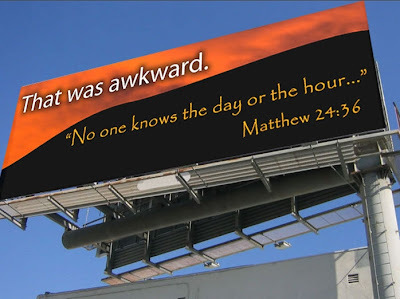 GREAT billboard. Not only was it awkward, it was also a lie from a "false prophet". Yep! Someone didn't read their Bible...or at least not ALL of it! I read somewhere that Family Radio was now a "non-prophet" organization. Ha Ha! LOL, very clever. And how true, how true. In spite of what the Bible obviously tells us, again and again some nutjob (or occasionally someone who really does mean well, but is sadly mislead) tells us he/she DOES know the exact time when Christ will return. One of them has written articles and recently a book for WND. I e-mailed him, pointing out various passages in the Bible such as Matthew 24:36, but have never gotten an answer back from him. either the guy is a nut and false prophet or there were alot of us who got "left behind". Now that was just funny. It is not funny. It is sad. We are a group of believers therefore we should hurt for those that thought God was telling them something and then it didn't happen. This happened to me twice recently and it has shaken my faith, trying to figure out if I was being led by the enemy or if God was testing me in obedience to Him. Think about the guy who spent $140,000 to tell others he thought the end was near. How devastated he must feel right now. Are all of you so sure when you hear the LORD speak to you that it is absolutely HIM? I'm sure that some of these people are as sincere as you and I. It seems there is happiness that these people were wrong and the Christians are gloating. My goodness, where is our Christian love?